Outstanding views, a tough climb, a cool creek cliff face, wobbly bridges, Scorched Earth Gap, and The Murder Hole are just a few reasons to hike Tinker Cliffs via the Andy Layne Trail. We were so close to this trail when we hiked Carvin Cove/Hay Rock that we knocked this hike out the same day. Tinker Cliffs is the third leg in the Triple Crown of great views/hikes in this part of Virginia, along with McAfee Knob and Dragons Tooth. Please Note: During the last several years the the Tinker Cliffs area has seen a significant increase in hiker traffic. Please follow the Leave-No-Trace hiking etiquette. There are unique rules regarding group size, and camping for this area. Please visit the Roanoke Appalachian Trail club page for full rules and regulations. It's around 3.8 miles to the top, but be prepared for an exhausting trek. You'll go through Scorched Earth Gap to get there, then look down on the valley where the Murder Hole cave is. Read the stories linked above about how they got their names, very interesting. Mile 0.6 – Cross the 1st Catawba Creek Bridge, parallel Catawba Creek with unique cliff face on opposite side of creek, then reach the next bridge. Mile 0.8 – Cross the 2nd Catawba Creek Bridge. Start the 200ft climb to the gate. Mile 1.2 – Arrive at the gate, and as long as you stay on the trail you are granted permission to go around the “No Trespassing” sign from the Roanoke Cement Co. The trail bears to the left around the gate, and in 100 yards bears to the right. The next portion begins the tough part of the hike, gaining 900ft+ feet before reaching the Appalachian Trail. One section has no switchbacks for about 0.4 miles. 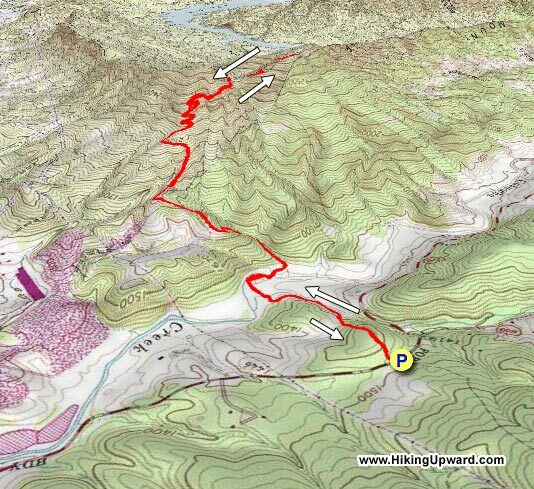 Mile 3.0 – Reach the white blazed A.T. and stay right/south, this area is referred to as Scorched Earth Gap. Continue 0.6 miles south on the A.T. for a beautiful view to the north. Mile 3.6 – View to the northwest of Broad Run Mtn and to the Northeast of Fincastle. Mile 3.8 – 1st view of Catawba Valley but a better viewing area is about 200 yards beyond. Mile 7.7 - Retrace your steps to return to the parking area. 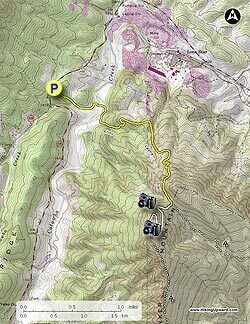 Note: If you're adventurous and need more miles, you could continue south on the AT to McAfee Knob, this would be approximately 18 miles roundtrip from the Andy Layne parking area. Don't rely on the published directions to find the parking lot. On Hwy 779, drive past the notated parking lot about 1/2 mile. After crossing a narrow bridge, the parking lot will be up the hill on the right. It is small, but well marked. #1 Use the coordinates provided on the site. If you don't and you just type 'Tinker Cliffs' into your iPhone map, you'll end up about 6 miles away from the actual parking lot. Finally finished the VA triple crown. Saved this one for last. Definitely the hardest of the three. Great views at top. Saw wildlife, snakes, deer et. more. At the start of trail followed one of the local cows for a while which was humorous to the party. Trekking poles recommended and a lot of water! I love this hike. The first time I hiked Tinker was Nov. 1, 2015, And it was the final hike in the triple crown. The fall colors were amazing. It was peaceful and we saw 6 other people. This time it is the second hike in triple crown, we did Dragon’s Tooth a few weeks ago and will be doing McAfee next, we started out with 6 cars in the lot, came down 4 hours later to a totally full lot! I was amazed how many people were going up as we came down! This hike is great, it has ups and downs and flats, cow field, bridges over streams, stairs, steeps, and it is varied, you go up a little down a little, along, up gradually, up sharply, then more gradually etc. the top has amazing views and we saw 3 hawks. The wind had a bite so we did not linger too long at the top, we took 4 hours total and are slow and steady hikers. My favorite overall hike in the area. Great workout and never crowded. Beautiful day today. It was alarming that I heard a couple of rifle shots at the beginning of my hike. Came across a hunter a few yards off the trail around mile 2 of Andy Layne (where you cut right and the trail widens for a spell). I plan to wait until hunting season ends before doing this hike again. Last of my trails for the Triple Crown. One Tough Hike for a ole man of 70. But I loved it ! I wished I had done this one first because I rate it as the most difficult of the three hikes. It is well maintained by the Trail Club that cares for it. I would say the views in Fall will be Fantastic for pictures. I took my camera and do a lot of photography but I'm One & done for these three hikes. If anyone is planning the Triple Crown, do this one first, Dragon Tooth second. Save the McAfee Knob for last . Because it will be your cake walk. I hike all the time, so I will be back out tomorrow !